If you know someone is going to lash out with a massive lethal response, shouldn’t you prepare for it? What should you be doing now? For example, should you take steps to remove their easy access to weapons? 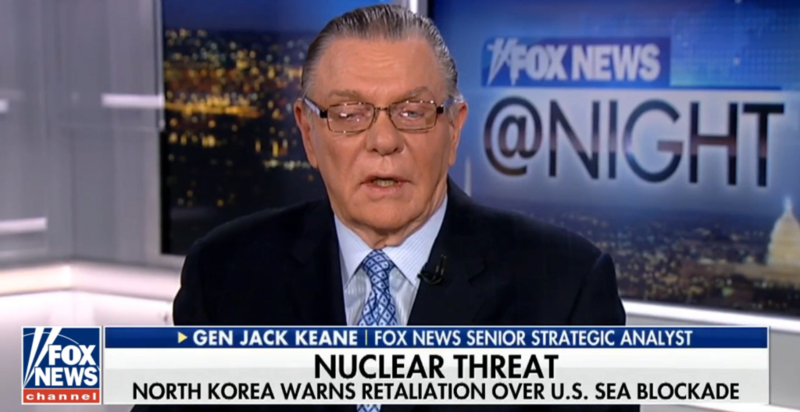 BTW, Fox News doesn’t tell you but my friend Lee Fang did, Keane has been on board of directors of General Dynamics since 2004 and, according to the company’s most recent proxy statement, received $257,884 in compensation (including “stock awards”) in 2016. Keane is also a special adviser to Academi, the contractor formerly known as Blackwater. It was founded by Betsy Devos brother, Erik Prince. We know cornered or wounded animals are dangerous, especially to the people in their vicinity. But their violent response is local. Humans who are cornered or wounded can also be dangerous and their response can cause destruction over great distances because of the tools we have created. In time travel movies the idea is that if you can travel to the past and make a change, it can change the future. But you don’t have to be a time traveler to predict how some people will act, just a good observer. I’ve correctly predicted how certain politicians will respond andI patted myself on the back. But my friend Cliff Schecter said it’s actually pretty easy to predict the future, it just doesn’t get you anything, unless you use that insight to change the outcome. Yet people HAVE predicted how Trump will react. Now they are just trying to control the timing of his reaction. The GOP is rushing the tax bill through hoping it will pass and get signed before Trump’s inevitable nuclear tweet. They have a duty to act, but they haven’t. They want the crisis to happen so they can take advantage of it. Disaster capitalism is a real thing. Should the people who fail to act, knowing the harm they are causing others, then profit from their failures? They can if we let them. The darkest timeline should apply to them too, especially since they brought us to it.